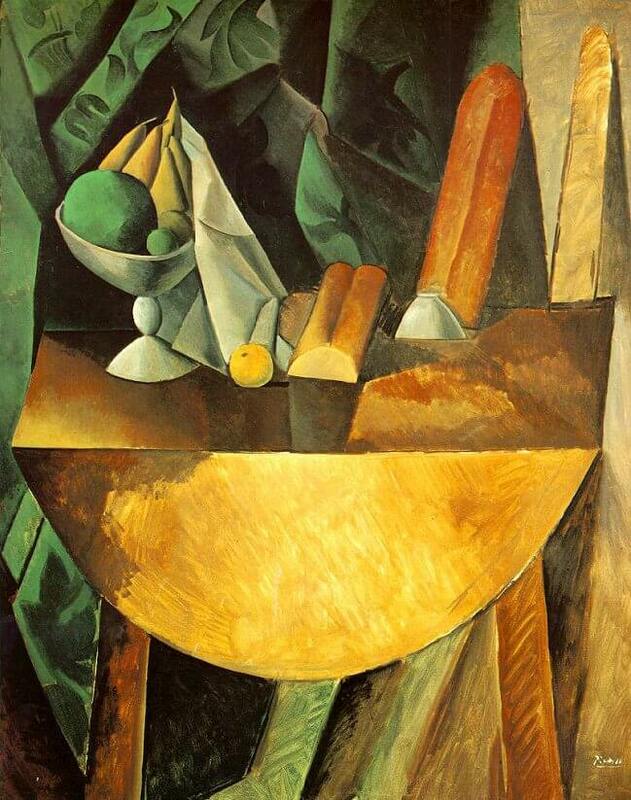 Bread and Fruit Dish on a Table, 1909 is the grandest of Picasso's works from the first winter of the new alliance and bears witness to his dialogue with Georges Braque. 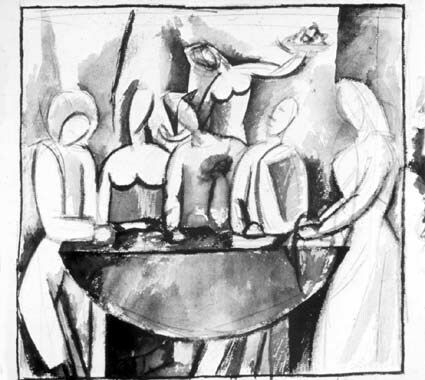 The canvas is an unusual size and shape for a still life and in fact Picasso adapted the composition from studies for one his own picture (known as Carnival at the Bistro) of costumed figures seated around a drop-leaf table - a change which involved eliminating all narrative and opting for the contemplative subject matter favoured by Braque. Bread and Fruit Dish on a Table also makes a network of allusions to Cezanne's grand Still Life with Apples and Oranges, borrowing favourite motifs (the patterned curtain, laden compotier, ruckled white linen cloth harbouring stray fruits, rustic table), imitating formal devices (the horizontal spread of the objects across the tabletop, inconsistencies in viewpoint, tilted perspective, variations in finish from dense impasto to barely covered canvas) and emulating Paul Cezanne innate sense of ceremony. (In Bread and Fruit Dish the laden table becomes a kind of secular altar.). Since Braque identified with Cezanne at least as closely as did Picasso, this homage to Cezanne was like the sealing of a pact of brotherhood.